We have a giant Wales flag that appears every now and then at Penydarren Park, it’s too big for most grounds in our league so it very rarely leaves the Pearl too. 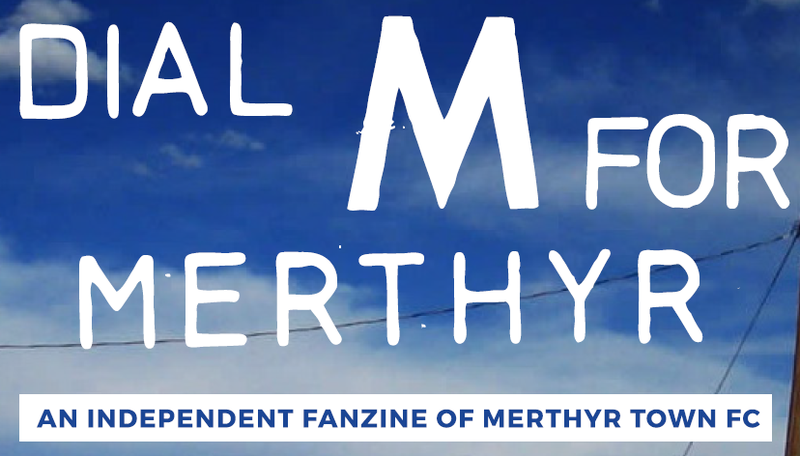 It’s banner headline is a play on the Socialist Workers’ Party slogan but for us it’s “Neither Cardiff Nor Swansea But International Merthyrism” and it tells a tale for all clubs in Wales in that we have our identity and most certainly culture that sadly a lot of football league fans just don’t understand. We’re comfortable in our decision to shop local. We don’t need the megastore to get our thrills on a weekend. We like drinking beer in the stands, we don’t mind other fans coming to our ground and singing, we don’t feel the need to defend anything, we swap ends at half time and we know that we very rarely win anything. So we don’t have to be a Bluebird or a Swan. Many of us will visit both clubs to watch a game and may even want them to win but it’s not the same for us because we love another. The Red Wall was built in France and every club formed a brick in that fortress of fun, tolerance and togetherness. Everyone was equal and free to follow their country in safety and in friendship. Liberty, Equality & Fraternity indeed. The Red Wall follows Bala, Port Talbot, Llanboidy, Ton Pentre, Machynlleth, Haverfordwest, Rhayader and every town and village team across our country and beyond. The only thing that matters is that you’re supporting Wales and having fun. One more thing though to remember is that if you’re a Barry Town fan then none of this applies to you.